Stress is generally painted in a negative light, but stress is the way that we survive, adapt, and grow. Stress can be healthy. Stress can make us pursue things, and stress can truly create a better you. The difference-maker is how we handle, perceive, and view stress. In this episode of the BioTrust Radio podcast, Shawn and Tim reveal 12 stress management techniques to reframe and help take the “stress” out of stressors and stressful events. Enjoy! Stress is not inherently bad. On the contrary, stress is the key to adaptation and growth. How we perceive and handle stress is key. Stress management technique #1: REFRAMING. This may be the most important tool for stress management. Many “stressful” events can be fortuitous. Stress management technique #2: EXPECTATIONS. Unrealistic and/or unmet expectations can be a tremendous source of unhealthy stress. Stress management technique #3: The 5 WHYS. Stress management technique #4: GRATITUDE. Practicing gratitude — particularly “in the moment” — can be an incredibly powerful stress management tactic. Stress management technique #5: MANIFESTATION. Embracing a manifestation mindset is key to transitioning from a “failure” to a “success” viewpoint when faced with challenges. Stress management technique #6: MENTOR. Find or be a mentor. Stress management technique #7: MEDITATION. Stress management technique #8: MINDFULNESS SKILLS. Stress management technique #9: DEEP BREATHING. 6 deep breaths can help lower blood pressure and the body’s sympathetic/stress response. Stress management technique #10: YOGA. Stress management technique #11: FOREST BATHING. Taking a walk outside in nature is very powerful for lowering the body’s stress response. Stress management technique #12: SETTING BOUNDARIES. Learning to say ‘NO’ may be hard, but it’s crucial for healthy stress management. We’ll take a deep dive into stress and discuss these 12 stress management techniques much, much more…Enjoy! How does deep breathing affect office blood pressure and pulse rate? Shawn: Hey, BioTrust Nation. We are back for another amazing episode. This is Shawn Wells and I’m here with my amazingly gorgeous, handsome, brilliant, talented, insightful partner, Tim Skwiat.Tim: Oh shoot, I was looking around the room to see who you were talking about. [laughs] Oh, thanks, Shawn. Right back at you.Shawn: He’s really the best. An incredible asset to BioTrust, the company, BioTrust Nation BioTrust Radio, and really just the world in general. I love Tim Skwiat. I love all things Tim Skwiat. Shawn: Thanks, man. We wanted to talk about stress and stress management. We’re high performers and we deal with stress and stress management. Stress management is key. How do we deal with stress? What do we do for stress management? Stress always gets this negative perception, right? But stress is the way that we survive, we adapt, we grow. Stress is healthy. Stress makes us pursue things, like in our career, and stress makes me be a better athlete when I’m playing volleyball. Stress makes me push more in the gym and be competitive with myself. Stress might make me decide to, hey I need to study, I need to prepare these notes to be on the radio, to be on this podcast, to prepare for this meeting with the other c-level people at BioTrust. So, stress isn’t bad. It’s all about stress management. And we’ve talked about stoicism and The Obstacle is the Way, and all that kind of stuff, but stress does truly create a better you. And it’s that hormetic response that the stressors cause adaptation and growth. Whether it’s figurative in your life or quite literal with your physiology, like with more muscle, with more ability to deal with stress when you have stress in your life. Whether it’s tougher bones because you’re repeatedly hitting boards in karate, right? And your bones will start to calcify and get thicker as a response to stressors. Because it says for us to survive, for us to deal with this stress, we need to toughen up. And we know that there’s creatures that live at the bottom of the ocean, of these thermal vents and extreme heat, like these thermophiles. And we know that there’s creatures at the bottom of the ocean that have bioluminescence, that glow in the dark and create their own light. And out of stresses there’s adaptation, and that’s one of the wonders of us as a creature. Yes, we have homeostasis, which means like we can maintain normal very well—like our body temperature, our pH, and all these things—to survive. But we also have this ability to adapt to stress. And I think it’s the beauty of life. Not just human life, but animal life and plant life, is that you’ll see that tree bend to the light. You’ll see the roots like reach all the way to where there’s a water source. You’ll see like the most amazing things in nature. So, I think stress often gets a bad rap, and it’s a very good thing. It’s how we handle stress and stress management, and how we can reframe things to make them healthy. Tim: Yeah, how we perceive it, right? Tim: That makes me think about something called allostatic load. Shawn: I love it when you use big words, Tim. I love it, I love it. Tim: Allostatic load, basically refers to kind of like this bucket that we have where we put all of our stresses. And I think it’s important to recognize that stress can be mental, emotional, or physical. It can come from work, it can come from exercise, it can come from relationships, it can come from finances, or it can come from expectations. Stress can come from a variety of places, and our body has kind of a single stress response, basically. We you don’t respond to financial stress differently than we respond to work-related stress. Basically it kicks in the body’s same type of stress response. So, going back to this allostatic load, there’s what’s called eustress versus distress, right? Like stress is inherently neutral. It’s how we respond to it — what do we do for stress management, that is — that makes it more of a eustressor or a positive stress versus a distress or a negative stress. And I think it’s important to point out, too, that like you were talking about, when stress is a short‑term and that eustressful side of things, it forces a healthy adaptation. But it’s kind of like inflammation. When it’s chronic and high, it tends to lead to poor health outcomes. When stress is persistent and unhealthy, then it can lead to bad outcomes as well. And so I think it’s kind of important to delineate some things and understand. Like you’ve talked about, some important stress drives adaptation in a healthy way, if we allow it to. But when there’s too much, it can lead to many negative health outcomes. I mean, brain health, heart health, gut health, skin health, weight management. Shawn: The brain will literally atrophy. Shawn: It’ll start shutting down. And it makes sense because we’re efficient. And if you stop using certain portions of the brain that may be associated with creativity and play and fun and just free thought, and all this stuff, and you’re trapped in this constant stress cycle, then those portions of your brain that you’re not using will start to wither, so to speak. And then the portion of the brain that you’re constantly stuck in is going to be overused. I mean, it makes sense. But yes, you’re right, that has the ability to just break you down over time. Tim: I think we talked about the brain. Stress can make you dumb. Tim: On one hand, it’s distracting. Like when you’re stressed out about that one thing, you’re negligent to think about these other things and it can make you forgetful. Like literally, stress can reduce memory formation. And then it’s going to shut off blood flow to regions of the brain that are involved in the memory formation. Like you said, that’s why you get some of that atrophy. Shawn: So, I’ve actually listened to a speaker that talked about this. When we’re in that mode, it’s a survival mode. Shawn: And it goes back. Think about if we were out in the wild and we were hunting, or if we saw tracks of something that is a potential threat to us—let’s say, some violent animal like a lion or something—and you hear the lion’s roar, you see the lion’s tracks. and you’re not going to be thinking about memories. You’re not going to be trying to create creative thoughts. [laughs] You’re not going to be in these other places. You’re very dialed. They’ve actually shown that like you don’t even have much peripheral vision. You actually close down your vision so that you focus very tightly on what’s right in front of you. So, yeah, a lot of your body is shutting down and saying, “Let’s focus. We need everything channeled here, now.” The problem is when you’re not in that type of literal stress. Shawn: Life-or-death type stress, but we feel that way. We’re putting our body in that state and we’re making that correlation. It feels like it’s life or death. Shawn: And a lot of young people feel things very intensely, in the teenage years, especially. And that’s why suicide is very high in that population and depression is high in that population because they feel things very intensely with all the social interaction. But with us, we need to recognize, like you were saying, delineate what’s real. And when you used the word “expectations” before, man I just feel like that’s a massive one. Shawn: Or if someone cuts you off in traffic. How do you reframe things? Are you making stress? Are you manufacturing stress? And I find that people that are stressed out often create more stress, and it’s like this downward spiral, right? If you’re in a state of stress, then it seems like everything is going wrong. Shawn: And it seems like anything that comes up is like, “Oh, really? Really now? Now you’re going to do this to me?” Or you’re angry at two people kissing and you’re like, “Look at this. Oh, gawd, it makes me so mad.” And it’s like your own insecurities and things you’re projecting out, and it’s your mood state, and you need to get that under control. Shawn: [chuckles] You know, you need to reframe, which is a critical stress management tool. You need to back up and reframe because, with the right stress management techniques, stress can be healthy, and these things that are happening are not bad. If you reframe and say, “You know what? I was looking forward to that one restaurant. I’ve enjoyed it in the past and I can enjoy it in the future. But you know what? This is a cool opportunity for me to check out something new and to enjoy it with these people,” and a lot of things in life that are unplanned are fortuitous. And those are the joys in life, is to allow for fortuitous things to happen, to find new things. You found that new thing once before. That one restaurant was phenomenal to you and when you first went you’re like, “This restaurant is amazing. I always want to come back.” So that’s why you’re disappointed if you can’t go. But there’s other things out there that are just as amazing that you’re not discovering because you’re locked into that one thing. So you need to allow for, what seems like negative stress, to be a positive stress. When I’m about to go speak on stage, I get stressed out. I start sweating and my heart’s racing and my mouth goes dry. But then reach into my stress management toolbox, I smile and I laugh right before I go onstage, and I tell myself, “I deserve to be here. Let’s go crush this. I’m going to help some people today,” and really I focus in on like the one person who’s kind of like super-engaged with me, and I’m like I’m speaking to that person. Even if there’s 2,500 people in the room, I’m like really like this person is super-engaged and really getting something out of this. And if there’s one person that’s really getting something out of this, then I’ve accomplished everything I want. Shawn: It’s that roller coaster. But know that stress is how you frame it. It can be you eustress, it can be distress, right? Tim: Yeah, absolutely. That’s awesome. And I like how you talked about the unmet expectations. I think that’s a huge source of this self-inflicted stress. And in those instances, and in all these instances, maybe particularly when we’re feeling the negative stress. It’s about being mindful of how we’re feeling and maybe why we’re feeling, because I also get the sense that in some of those instances where it might feel like a little bit of anxiety or stress, there may be some underlying reasons. Like maybe I wanted to have more control over what was going on. And if you can start to identify why you’re feeling that way, then you can rationalize with it maybe a little bit more and say, “Should I really be feeling stress about this?” After all, like you said, and then reframing it too. So, just practicing that mindfulness, awareness can be the first step to managing that stress. And that’s something I think we want to get into. We’re all going to feel this way at times. We’re all going to feel these negative effects of stress, in terms of that anxiety or just like the bubbling of anger or fear inside of us. So, how do we manage it? How do how do we deal with the stress? Shawn: You brought up the five whys before. What about using that on yourself? Shawn: Really delve into what’s driving this behavior. Is it like those two people kissing that are just horrible people? Is it this restaurant, “I can’t stand this restaurant.” Or what is it? Shawn: Let’s take a step back and what is it really? A: I’m feeling really upset now. I’m feeling really stressed out about this couple that’s kissing. Q: Why are you upset about them being happy? Q: Well, why are you not happy? Q: Well, why did that happen? And then you start to peel back the layers. And it might go way back or it might just go back to like you just woke up on the wrong side of the bed today and you just have a short end of the stick today, or just a short fuse. And I think it’s an extremely important example to really defuse some of that stress that you might be feeling, because you really understand where it’s coming from. And again, rationalize whether or not that’s like legit. Shawn: Well, and not just even be aware of it short-term, like in that moment, but you might start realizing that more long-term things that you need to address that are insecurities, that are ongoing issues. Maybe you’re in an abusive relationship, maybe you’re in a financial situation where you’re overextended on your credit, and maybe it’s because you’re in med school, or maybe it’s your health and you’ve been told that you might have cancer or something. And you’re like okay well this is going to not go away for X period of time. I can start making some decisions that can better my situation when it comes to these things. But I also need to be aware that this thing is going to be here. How am I going to address my life, moving forward, so that I can be a positive person despite this thing being in my life? And I’m not going to let it wreak havoc on everyone around me, all my interactions around me. You can reframe. You can say, “Yes, I potentially have cancer. But you know what? I’m going to address it and I’m going to grow stronger as a result of it. I’m going to educate others on it around me. I’m going to get healthier in my relationships and my exercise and nutrition. I’m going to grow closer to my family as a result of this. And when I come through the other side of this, it’s going to be my greatest story, and it’s going to be something that defines me and my strengths. I’m going to appreciate the relationships I have, of the people that really support me through this process, even greater. And I would have never known the strength of my relationships unless I had something like this come up.” It’s all reframing. Tim: Yeah, and kind of another thing that I teased out of there was just the act of practicing gratitude, actively, and it just sounded like that was something that you were talking about there, too. And how that can help us put us in that positive mindset and help us reframe in a more positive way. It takes practice. I mean it certainly takes practice, and we’ll catch ourselves. I know that I catch myself being negative or feeling that way. And that’s where that mindfulness comes into play, is just to catch yourself and the best you can, take an objective outside look at things. Be compassionate with yourself, but at the same time be honest with yourself. Shawn: Or if they lose all their money they’re like, “You know what? I’m getting my resolve tested. The universe is testing me, but I’m going to push back.” It doesn’t matter what happens. They’re like “boom.” And then if something positive happens, they’re like, “Here it is. Here comes what I manifested.” And it’s just like no matter what happens—good, bad, or in the middle—it’s like they’ve manifested it and it proves them right. And that mindset is a powerful mindset that you’re constantly reframing. Tim: Yeah, absolutely. I mean, we’ve talked about the success-filtered glasses versus the failure-filtered glasses. I mean, people have a tendency, it’s the natural tendency is to look at things negatively. But like you said, when you flip it, instead of viewing things as setbacks or failures, you start seeing them as challenges that can make you better. It changes things, and that’s a huge piece of the stress management puzzle. Like when you were talking about that, it made me think about Michael Jordan. Do you think Michael Jordan wanted to be up by 40 points every game in the fourth quarter and just sitting there on the bench? I mean everyone once in a while is probably cool, but it’s like, “No, we’re going to be down by a couple, with a few seconds left. I want this shot I want to do this.” That’s a very special breed and it takes practice. It just doesn’t happen overnight. We all have fear at some point, but when we allow that fear to become a healthy kind of a giddy excitement to some degree, there’s a very fine line between those types of things, in my opinion. What is that fear inside of us? What is that? It’s a giant, ready to awaken and allow us to be the full version of ourselves. Shawn: Yeah, I also feel like that’s a great point about stress management. Whatever it is that’s causing us stress, someone else would probably be thankful for. Shawn: [laughs] I mean, let’s reframe here. Really, how bad are the things that you think are bad? Like, “I’m stuck in traffic,” or “This movie’s late,” or whatever it is. It’s like man, bro, or like, “My clothes, man I got Hanes underwear instead of some designer underwear.” or I’ve got whatever jewelry instead of diamonds. And someone’s like, “You got jewelry?” It’s like you’re doing well. We always compare up, what we consider up, and we think things are going to be so much better when we get there. And we’re never looking back at all the people that don’t have all the things that we’re stressed out about. But here’s news to use, too, those people that have the Swarovski crystals and the Diamonds, and the Lamborghinis, and the mansions, and the yachts, and the beauty, and they travel the world, and all these things, ah, most of them are miserable and they’re not really enjoying life. And they feel stressed out because there’s someone that’s one step ahead of them, and they’re miserable about that person. And they want what they have, and they feel like if they just got X, then they’d be happy. Happiness is a choice. You’ll never get there. It’s truly a choice. And there’s kids in Africa that have next to nothing, but are happy. True joy. Shawn: And they’re happy to just dance and sing with each other while they work and have companionship. And they know nothing else, so they think it’s joy. Again, it goes back to expectations that we’re beating ourselves up with all these things that capitalism throws at us, marketing throws at us, and says you want happiness, you need this thing. Shawn: You need to be here. You need to have this. Otherwise you won’t be happy. And it’s not true. It’s not true. It’s not stuff-related at all. We need to choose happiness. We need to reframe and be thankful for all the things that we have, including these “stresses” that come up. Tim: Yeah. That’s awesome. Very well said. And like we were talking about before, happiness comes from meaning and having purpose in our lives. Tim: And you can’t fill that purpose, that meaning with stuff, right? And I think that’s something that you’re getting at there too. No matter how much stuff you have, if that if that huge hole is not filled with purpose, then you’re going to keep looking for—in the wrong places, usually—stuff. Shawn: Yeah, that reminds me of the TED Talk I showed you earlier. What are those four pillars? Tim: I can’t remember who that was. We’ll link it in the show notes, but she was talking about the four pillars of meaning. One is belonging, a sense of belonging. You can think about that like being part of a tribe or something, a sense of belonging. The second one was a sense of purpose, and our purpose is to serve others. And so that was a big one. The third one is transcendence. And the way that she talked about transcendence was like kind of go into this place where you just go. Kind of an out-of-body experience. I summarized it as “flow.” People talked about like getting in the zone, and that’s what I some summarize it as. Tim: And then the fourth thing was storytelling, and that where the authors of our own narrative. And the book is not written yet. Our book, our story is not written, and there’s pages ahead of us and we can write and edit. And everything that’s behind us has been written, but we have the capacity to, she said edit. I don’t think we can go back and edit what was there, but we can use that as part of our story and we can influence and change what lies ahead. Shawn: I think when she says “edit,” it’s kind of going back to what we’re talking about here with reframing, which we keep coming back to as a central tenet of stress mangement. Like how you perceived what happened to you. If you had bad things happen in your childhood, but you’re successful, what is it that you’d really want to change, if it’s led you here? And we have to look at that. We shouldn’t look back on our past with regret. We should have a piece about our past and appreciate where it’s led us and the lessons it’s taught us, and who it’s made us. If we let it, we can have it be a positive. And it has shaped who we are, and therefore, who we are can be the story that we share with others. Shawn: And others out there have experienced whatever you’ve experienced. And I love the storytelling thing because people love stories. We used to sit around campfires and that’s how we connected with each other, is storytelling. Myths and religions and just our childhood and what we did today. It’s all storytelling and we connect. And we connect a lot less with lists than we do with stories, so when things are framed in the story, we love that. But there’s a book I was talking to you about, Donald Miller, Building a StoryBrand, he talks about. That all these heroes in the past, all these books, are built on this hero’s journey. And it matters where you go from. You were like the broken no one that somehow makes good and becomes the hero, like I said, Luke Skywalker, Rocky, Rudy. We love that story—Braveheart, Gladiator. All these stories that we love, it’s the no one that succeeds against all odds. So, let me ask you, if you were that kid that was given incredible beauty, brains, money, everything you’ve always wanted, what kind of person would you be, and what kind of story would you have to tell? You’d probably actually be a horrible person and you wouldn’t have much of a story to tell, and no one would want to hear it. So, if you’ve had hardship in your past, that’s your story. This is like the movie that you can become the hero in, where you make good, and people can connect with and say, “Man, look at that person. Look at the odds that they’ve come against and they’ve succeeded.” And they want to hear that story and they want to take part in it, and they want to learn from you. And you can be that mentor now to other people. And you can take stress out of their life and say look I’ve done this, you can do this. If you want to talk about removing stress from your life, remove stress from other lives around you and it gives you purpose, right? [chuckles] And it gives you reframing. Because now, instead of those terrible things that have happened to you, they’re stories. Instead of them being so bad, they’re purpose. Instead of feeling isolated, you’re belonging. It’s like those pillars, right? Instead of being trapped in a state of sympathetic stress, now you’re in a flow state. You’re in transcendence because you are going to the top of your pyramid of Maslow’s Pyramid by self-actualization, and you’re helping someone else get to the top of their pyramid. Which I think, ultimately, is the truest self‑actualization, is to help others reach their purpose. Tim: Yeah, that’s more powerful stuff right there, Shawn. You talked about using your story and that reminded me of my wife, Amy, who’s a therapist, a counselor. Like all of us, she has gone through or had experienced a lot of unfortunate things in her life, but from the very beginning of our relationship, whenever we talked about those things, she always had a convicted, a very convicted belief that she went through those things for a reason. And she knew that she went through those things to help other people, who will be coming in her life and experiencing the same thing, to help them get them through them. And I always found that to be heroic. Tim: And she wasn’t just saying that to like try to convince herself of it. She literally believed that. And I was like, “Where did you get that from?” It was just inherent to her. And now she’s a therapist, a counselor, helping people. Shawn: That is the ultimate hero’s journey. That she went through all that stuff, she saw the purpose in it, she made good on it by becoming a therapist. Then the next stage in the hero’s journey is becoming the mentor and helping other people to become heroes themselves. Shawn: So, she did it. Tim: It’s awesome. I’m very proud of her. And when we were talking about this storytelling component of the four pillars of meaning, I also had mentioned to you that I thought it was really ironic because on my wife’s website she talks about that very same thing. She basically uses that same metaphor, that we’re all the authors of our own story, and just because of what things have happened in the past doesn’t mean that our story is done or that it’s written. We have the capacity to edit, or reframe, or basically write what lies ahead. But that’s up to us to do it. No one else is going to do it for us. We have to commit our mind to it, right? And sometimes we need help. Sometimes we need the mentor. Really, all of us need the mentor, the coach, the accountability, the guidance, and all those types of things. Shawn: It kind of it kind of makes me think that all of this stuff relates to the reframing of stress and the hero’s journey, and all of it, is that we have the power, like you’re saying, to write our story. That the power is within us. And I think when you’re in a state of stress versus that manifestation state, quite often you feel like life is happening to you, instead of you being in control and you saying like this is—like you said—happening for a reason, and I’m on a path and no one’s stopping me from being on this path. And yes, something has come into my path, but it’s here for a reason and I’m going to grow from it. Instead of just feeling like life is spinning out of control and just things are happening to you, and you’re frustrated and it’s chaos. I think if you start feeling like you can be the author, that it radically changes your degree of stress management. Tim: Yeah, 100%. So, I think kind of maybe practically speaking, some things that might be able to take away, so far as stress management techniques. One stress management tool seems to be just having that mindfulness and awareness of how you’re feeling and what you’re feeling. Kind of like maybe going through and asking yourself the five whys. And then another stress management technique might be to reframe. Like if you find yourself feeling negative about something, how can you flip that? And you gave several examples of reframing. What would someone who’s not in my shoes feel about this, or something like that. Or how can this be a positive eustress for me. I think finding a mentor and/or being a mentor is another take-away stress management skill that I’m getting from this. And that could be like a coach or it could be a therapist. It could be a mastermind type of group and then finding someone that you can maybe even mentor as well. Shawn: And some of the obvious ones are just taking that step back to allow for the reframing, to allow for a mentor to step in, to allow for this authoring. If you take that step back, you close your eyes, you breathe, you change the mood of the moment, then those are those are skills—meditation skills, mindfulness skills—that allow you to transform what’s happening to you. Shawn: I mean, it’s important to de-stress yourself. Just the deep breathing allows for that. It’s like six or seven deep breaths? Tim: Six deep breaths can actually lower that sympathetic response and be a very effective stress management skill. Shawn: Yeah. So, just doing that instead of reacting and regretting whatever comes out of your mouth, or an action that you might have, be it one of violence or verbal abuse or things that are going to happen, typically that come out of someone poorly dealing with stress. A lot of that stuff we regret and that hurts other people or hurts ourselves, or both, comes out of poorly dealing with stress. That if we just take a step back, take six deep breaths, try and reframe this, and say what is the positive that could potentially come out of this, and then speak. It’s probably going to be a whole lot better than whatever would have just came out just out of the moment. Tim: Yeah, absolutely. And like you said, poorly dealing with stress there because key components of the stress management equation in addition to things that we’ve talked about, there’s all kinds of different strategies, tactics you can take. You mentioned meditation, you mentioned breathing exercises, yoga certainly effective. I think another one is forest bathing, or that’s a nice way of saying taking a walk outside in nature. I think setting boundaries is another big one, and setting appropriate expectations. So, I think those are a few things that could go a long way to improving stress. And make sure that you’re taking care of yourself in terms of your sleep, exercise, and nutrition, can also be tremendously important for resilience. And there’s certainly certain herbs that can be helpful with stress management too, such as like Rhodiola and Ashwagandha, and other adaptogenic herbs. Shawn: Yeah, Ginseng, Schisandra. Yeah, there’s maca. Tim: Eleuthero might be another one, too. Shawn: Yeah, the adaptogens are really wonderful to help with stress management. But one thing I’ve been learning, that you just mentioned, is the setting boundaries thing. And again, that brings the power back to you and it’s not just life happening to you, where you have your passive-aggressive response where, “Man, this guy took advantage of me.” Well, did you set expectations, did you set boundaries? And you didn’t say “no.” You didn’t set the boundaries appropriately. You didn’t lay it out. And I know I’ve been mad at so many situations where I could have controlled it a whole lot better. I could have laid it out from the beginning and said I’m not going to take on this project, but if I were to take on this project, here’s how I’d lay it out. Such-and-such, here’s the time frame, here’s what I can deliver on. But if you just let life happen to you, then you can’t be mad with the results. Shawn: So, I like that learning how to say “no” is a powerful thing in terms of reducing your stress. But man, I think this was a really good episode on stress and stress management. We actually had [laughs] Nine Ways to Deal with Stress, as an article in front of us, and we used none of it. Tim: No, we did better. Shawn: Yeah, that’s okay, because I like what we did because it was more personal. And I hope everyone listening appreciated it. I know I love our conversations. Tim and I really just vibe and we get deep sometimes, and I and I love that. I know we can talk science, but I like when we just get deep, too, because it’s just real. It’s our stories, right? Shawn: A lot of it’s about our stories. And our purpose is to help and to serve you, the BioTrust Nation, you listeners. And hopefully you’re feeling that we’re fulfilling our purpose, and hopefully you can fulfill your purpose by taking this information and your story and helping others as well. One way you could do that is on the BioTrust VIP area, where you go BioTrust.com/VIP. It’s a Facebook group that’s really amazing. There’s all kinds of transformation contests and just sharing, and caring, and learning, and supporting that’s there. And we have awesome articles at BioTrust.com/blog, many of which Tim has written that are really well-written and scientifically cited. 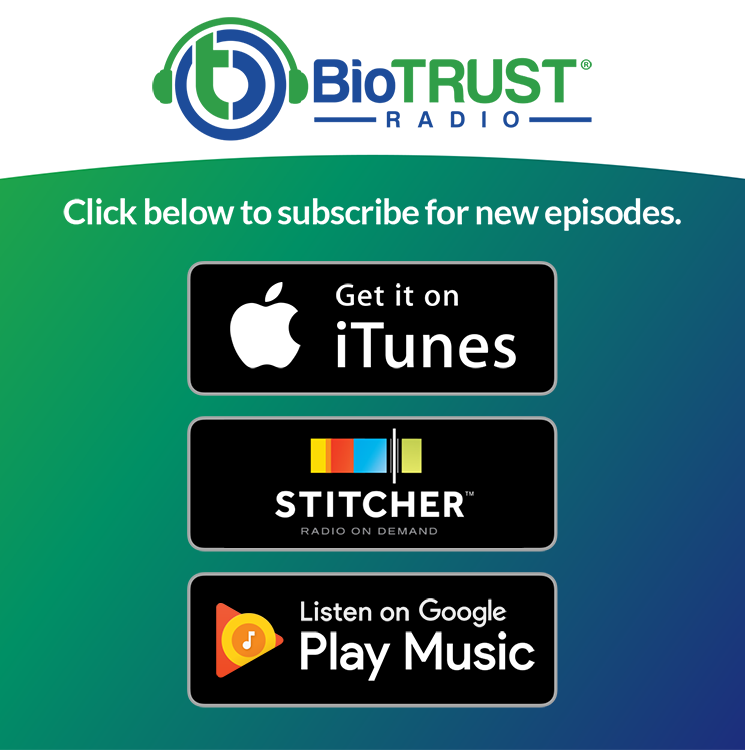 And lastly, we have all these episodes of BioTrust Radio on BioTrustRadio.com. And we have the full transcripts, so if you want to read along while you listen or you want to check links for things we’ve mentioned, everything is there. And if you’re just listening on Google Play, iTunes, or Stitcher, we appreciate that too. Wherever you can support us, we’ll support you, and hopefully you feel that. So, really thankful for you, and we’ll talk to you guys soon. Thank you.